What happens whenever terror strikes in America? What can you count on to happen for sure? Yes, Americans will laugh in the face of the attackers and go about their busy lives (just as New Yorkers did when they went out into the night on Halloween after a terror attack left 8 dead and 11 wounded). No, it's the sudden influx of "journalists" to the strike zone -- rushing in like moths to a flame to do breathless reports from the streets to show that, hey, we're just like you, man, out on the street. 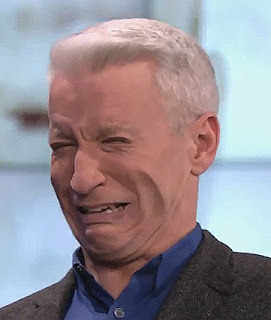 Well, that didn't go so well Tuesday night for CNN's Anderson Cooper. No, everything was fine at his $4.3 million pad in Greenwich Village. But Cooper had to go from CNN's midtown offices down to (gasp!) lower Manhattan so he could give his important insight about the terror attack. Some fans of President Trump were there to greet him. As Cooper, standing on the street, read an intro for a reporter, a woman can be heard yelling from off-screen: “You’re reporting on an ISIS attack, right?” Cooper, looking a bit annoyed, glances off screen, then carries on. Then a man shouts “Where’s Kathy! ?”, apparently referring to Kathy Griffin, a longtime Cooper pal who was fired from CNN after releasing photos of herself holding a rubber model of Trump’s decapitated head, covered in blood.